U.S. Rep. Steve Chabot introduced Save the Delta Queen legislation in the Houselast October, and nowSenators George Voinovich and Sherrod Brown have introduced identical legislationin the Senate. "As I have said many times before, the Delta Queen is an Americantreasure that needs to be saved," Chabot said. "I appreciate Senator Voinovich andSenator Brown joining this fight, and I look forward to working with them to protectthe Delta Queen." Sen. George Voinovich on Tuesday tossed a lifeline to the Delta Queen's tenuous future as an operating overnight steamboat, with a bill to extend its exemption from the Safety of Lives at Sea Act. Voinovich, R-Ohio, introduced the bill, first reported by the Courier in August, with co-sponsors Sen. Sherrod Brown, D-Ohio; Tom Harkin, D-Iowa; Thad Cohran R-Miss. ; and David Vitter, R-La. The bill would renew the boat's 40-year-old exemption. A House measure is stalled in the Committee on Transportation and Infrastructure, chaired by Minnesota Democrat James Oberstar. Without the exemption, the historic riverboat will be forced out of the overnight passenger cruise business after Oct. 31. We had a fabulous rally in Maysville yesterday with another one coming up inPoint Pleasant next Tuesday, Sept. 16. Senator Jim Bunning, of Kentucky, got an earful today from the steamboatcommunity when he mistakenly came out against our Queen. Maybe he is justlow on facts, or something. Anyways, I called up and spoke to an assistantwho told me she has already fielded many calls from concerned citizens. Ifyou call him, be brief, be friendly, and say thank you. I perhaps blubbered on too long, and mentioned that my father, Bill Muster,was a strong supporter of the unions. She hesitated for a moment, so I said,"Not too much union, not too little, but just the right amount." Here is what I meanby that. First, as a child, my father would always give us a report of the doingson his latest trip to Cincinnati or Washington, DC. I remember one time he toldus that a "new" union was trying to get on the boat. Greene Line already had all the unionsit needed, and the crew members did not want the additional fees.Nobody wanted the union. My dad told us that the union man had offered to give himcement shoes and throw him in the river. Of course, as a kid, that scared me! I am not sure what came of that. The cement shoes thing never happened. However, I get thatstory confused with the one about Representative "Bribe Me" Garmatz, because I am sureGreene Line prevailed in that situation. As far as the unions, I remembermy father saying they made the "new" union go away. However, recently someone elsetold me that my father capitulated. I do not think that is true, though, becausemy dad was always good with the unions. He liked them and they liked him. There was neverany friction with my father in charge. Birthday wishes go out to Dennis Shenk (now retired),Chief Engineer on the Delta Queen then the Mississippi Queen & then the DeltaQueen again for many years!!! 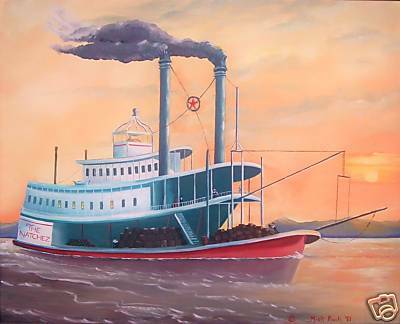 Maysville, KY - A Save the Delta Queen steamboat rally will take place Tuesday, September 9th beginning at 11:00 a.m. at Limestone Landing in downtown Maysville, Kentucky. The Delta Queen is the last traditional steamboat carrying overnight passengers on America's inland waterways and for that reason has been designated a National Historic Landmark. In 1966, she was inadvertently caught in the technical provisions of the Safety at Sea Act, which was intended to cover ocean-going ships, not riverboats. Recognizing the difference between boats that operate on rivers, within yards of the shore, and ships that sail the high seas, Congress established an exemption for the Delta Queen in 1968. Since then, the exemption has been renewed nine times, in virtually every case by near-unanimous votes in both the House and the Senate. Without congressional action, the current exemption will expire at midnight on October 31, 2008. Bipartisan legislation to extend the exemption (H.R. 3852) was introduced by Congressman Steve Chabot of Ohio on October 16 of last year. It remains in the House Committee on Transportation and Infrastructure because Committee Chairman James Oberstar of Minnesota refuses to release it to be voted on by the full House of Representatives. Senator George Voinovich of Ohio has announced that when Congress reconvenes after the August recess, he will introduce an exemption bill in the Senate. The September 9th rally will feature speakers from the Save the Delta Queen Campaign, state and local government representatives, Bill Wiemuth, Delta Queen Historian, and a representative from the office of Congressman Geoff Davis, who is a cosponsor of H.R. 3852. Music will be provided by Saint Patrick's Elementary and High School choirs. To learn more about the Save the Delta Queen Campaign, visit www.save-the-delta-queen.org, or contact Vicki Webster at 513-381-3571 orvjw[at]olypen.com. Call or write to your two U.S. Senators and your U.S. Representative - ask them to save theDelta Queen. The steamboat community has buyers negotiating to buy the boat, who will reinstatethe unions and keep the boat running. Meanwhile,Senators and House Represenatives are trying to introduce legislation that will grant herthe exemption. Keep up the steam!! Never say die!!! I was leaving on the Delta Queen. I wasn't ready to go, I'm never ready to go. I'm never ready to go. I would like to let people who live in the Upper Mississippi area know about Second Age. It might interest you as it contains descriptions of river bluffs and of locks, wing dams, and more along the Upper Mississippi, and you are working for steamboats along the river. My dad wrote a book about a time in his life when he was a young man and he described those times, the early 1930's, in personal and interesting ways. His name was Carl Franson. You can find out more about the book online at http://www.rootlets.com/secondage/secondage.html. My dad was raised in Fridley, Minnesota and attended the School of Agriculture at the University of Minnesota. One winter he and friends built what they called a floating house (a houseboat) where they planned to live while completing college, but two of them, my dad and poet friend Clarence Jonk, floated part way down the Mississippi instead. His book is about this time, about people, places and environments there, and also about travels to the Far East, when he worked aboard the President Cleveland. He wrote all this when he was quite elderly and was delighted when he was able to re-live his adventures as he wrote. He wrote simply and with charm, and the reader is pulled right into the times and places with him. There are also original photos that he chose to include in his manuscript. I've made no changes. It's his book. My family is gone now, and I wanted very much to publish my dad's book for him, in his memory. He mentions areas and places from Lake Johanna, MN to La Crosse, WI, and places in Japan, the Far East, and the Phillipines. Specifics are from an era gone by but the nature of challenges he faced are the same as those we face today. People who have read Second Age have told me that they have enjoyed it. 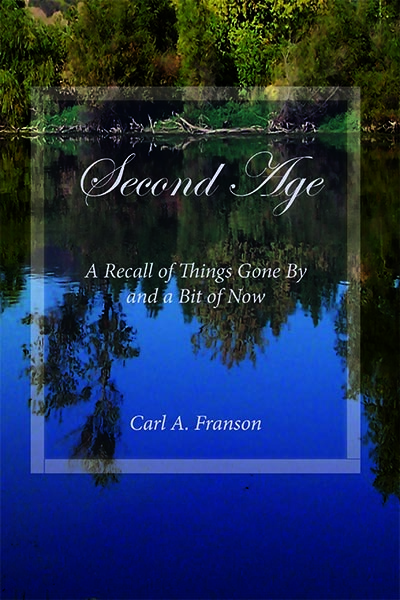 Editor's Note:Second Age is now available in the Steamboats.com Bookstore.Clickhere to see the book at Amazon.com. Click here to seethe Steamboats.com Bookstore (at this site - an Amazon Associate). Note from your webmaster: Earlier this month we upgraded our domain host server.During the process of migrating the site, Steamboats.com was off line for threedays. We apologize for any inconvenience this may have caused. It caused a lotof anxiety at the Steamboats.com secret headquarters, but it's all water underthe proverbial bridge now. Party on!! Does anyone have information on a boiler explosion on the PeoriaRiver (IL) in September of 1866. My GG Grandfather was allegedly killed inthis event. CINCINNATI - Congressman Steve Chabot (R-OH) has formally invited House Transportation Committee Chairman James Oberstar (D-MN) to view the safety features onboard the historic Delta Queen steamboat. In a letter sent last week, Chabot invited Chairman Oberstar to tour the boat on August 26, or any other date the boat is scheduled to be in Cincinnati this year. Chabot also offered to arrange a tour for Chairman Oberstar when the Delta Queen is closer to his Minnesota home. "I am hopeful that Chairman Oberstar will take the time to personally view the tremendous safety enhancements that have been made over the years to ensure that every cruise aboard the Delta Queen is safe," Chabot stated. Last year, Chabot introduced bipartisan legislation (H.R. 3852) to allow the Delta Queen to continue to operate as an overnight passenger vessel. The legislation has been referred to the House Transportation Committee, which Chairman Oberstar leads. The Delta Queen is currently operating under a congressional exemption that is set to expire on November 1, 2008. The Delta Queen began operating as a sternwheel river steamboat in 1926 and was designated a National Historic Landmark in 1989. For the last 40 years, the Delta Queen has safely operated on the rivers of the U.S. under a congressional exemption due to the paddle wheeler's wooden superstructure not meeting certain regulations specified under the 1966 Safety at Sea Act. While Congress originally intended this law to apply to ocean-going vessels, the Delta Queen, which is never far from shore, was unexpectedly caught-up in these regulations. Recognizing the difference between boats operating on inland waterways and those operating at sea, Congress established the exemption in 1968 and has renewed it on nine separate occasions to allow the Delta Queen to continue overnight passenger cruises. Rate this Site: Searching for the boat of my dreams. Post to guestbook: click here. Editor's note: Here is Mark's painting, which you can buy at eBay.com.